The self-contained family holiday bungalow, Bicheno By The Bay, as the name suggests, is a luxury accommodation set by the Tasman Sea. They have One, Two, Three, Four Bedroom Bungalows as well as Motels and Cabins while all of them are equipped with covered car port, deck, open plan lounge and kitchen areas. The tranquil vistas of the water of the man-made lake and Gum trees are complemented by the outdoor pool, tennis courts, pirate playgrounds, communal fire pits and orienteering course. The complex boasts of 8 acres mature native vegetation including Eucalyptus, acacia and so on; these are home to possums, bandicoots, wallabies, echidnas, yellow-tailed black cockatoos, laughing kookaburras, wattlebirds and tawny frogmouths. Enjoy the water and the native animals while plonking on the couch of your own Bungalow at Bicheno by the Bay. To personalise your visit to the city, you can use an all-inclusive Bicheno trip planner for the same that will give detailed information about visiting the city. You can enjoy a comfortable stay in the city by booking the best hotels in Bicheno like Wintersun Gardens Motel, Bicheno Cabin Park and Bicheno's Ocean View Retreat. Create your own Bicheno vacation packages or choose from the ones made by travel experts. Also explore the best ways for how to reach Bicheno. How popular is Bicheno By The Bay? People normally club together Bicheno Visitor Information Centre and Bicheno Blowhole while planning their visit to Bicheno By The Bay. Superb yet casual place to stay in Bicheno. I so enjoyed it there. Staff were very nice and accommodating. 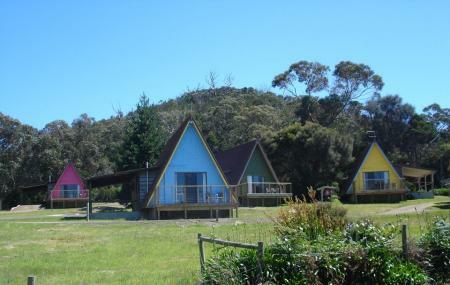 Quite a variety of cabins for different sized groups, some colourful and cute. Excellent views of ocean and Waub Bay. Close to coastal and headland walks, check the Bicheno blowhole. 5-10min walk to town for groceries, restaurants and cafes, parks, shops, services, bottle shop and pub. (Services close 5pm or 6pm). Short drive or bike ride to other side of town for golf course, restaurants and other good things. Bikes for hire at Bicheno By the Bay. We stayed here for 5 nights. Wish we were staying longer. So close to town and also by the sea. The beach hut we were in had a view of the blow hole. Facilities were great and the staff were very helpful and friendly. Bicheno is a great location to base yourself for day trips up and down the coast. The penguins come in right at your door, which was a highlight for me. Especially with baby penguins on the property. Also had wallabies, possums and rabbits on the grass right in front of our hut. Comfortable bed (super important) and a well equipped kitchen. Also had a bath which was nice and a washing machine and clothes line which was very convenient. The pool was warm enough to swim in and there was a great bbq. Couldn't fault anything with Bicheno by the Bay. Will definitely stay here again. Staff were friendly but disappointed with our accommodation. Things are a bit tired and dated. We were a couple but had a family unit as all that was left when our agent booked. Not sure what the other units were like? Felt it was very basic and kitchen not terribly well appointed. Needs full size cooker if you were to cater for family I think. We were allocated only one toilet roll! There was a large stain on the carpet in the lounge area which gave the impression of not being clean. The bed was comfortable. Location good for beach etc.